Fifth-year veterinary students from Thailand (left-right) Lalida Tantisuwat, Latticha Pluemhathaikij, and Napasorn Ngamrojanavanit visited the Purdue University College of Veterinary Medicine this summer as part of an international university exchange agreement between PVM and Thailand’s Chulalongkorn University School of Veterinary Medicine. 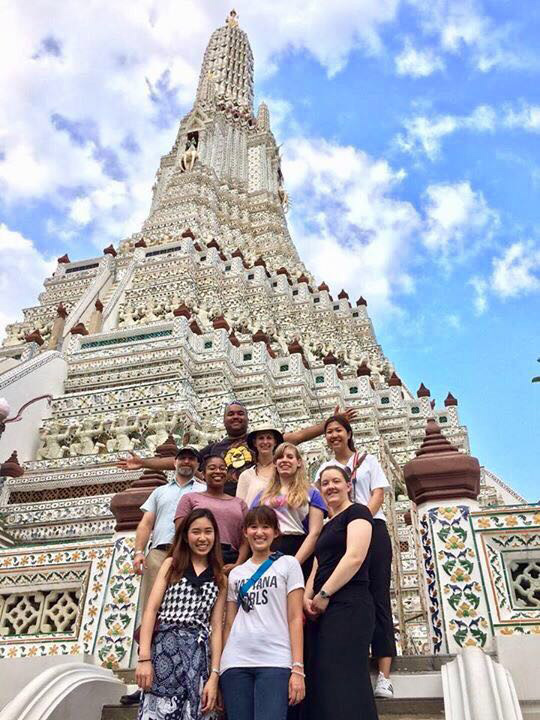 After returning from their visit to Purdue this summer, three Chulalongkorn University (CU) School of Veterinary Medicine students teamed-up with a PVM delegation that traveled to Thailand as part of the exchange relationship between PVM and CU. PVM Assistant Professor of Molecular Diagnostics Samuel Yingst (far left in photo) led the group of PVM students. The impact of the agreement was evident in Lynn Hall this summer as PVM hosted a group of exchange students from CU. 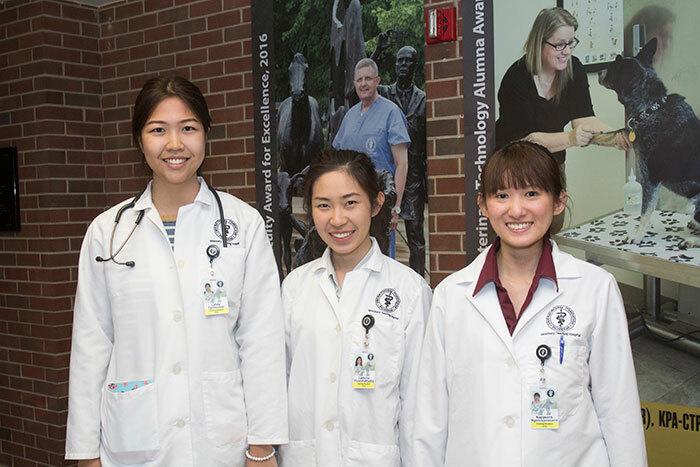 Napasorn Ngamrojanavanit, Latticha Pluemhathaikij, and Lalida Tantisuwat are fifth-year CU students who rotated through the ophthalmology, cardiology, small animal community practice, anesthesiology, and behavior sections in the Small Animal Hospital. Also this summer, a group of six PVM students led by Dr. Samuel Yingst, assistant professor of molecular diagnostics in the Department of Comparative Pathobiology, traveled to Thailand for a 14-day course combining unique cultural experiences with broad exposure to veterinary medicine from multiple perspectives. The students learned from staff representing the diverse opportunities for international veterinary employment, while also gaining a deeper fundamental understanding of the veterinarian’s role in the global community. CU hosted a portion of the visit, which also included additional programs to provide a wider range of veterinary medical, cultural, and geographical experiences. CU is among the premier veterinary schools in Asia. PVM students will be able to directly participate in clinical activities at the university over the course of their program. As rabies remains endemic in Thailand, students will have the unique opportunity to understand the efforts to control the disease in the context of a Buddhist culture (didactic only – no added risk of infectious disease exposure). CU also leads research on the transmission of viruses between humans and bats, and it is expected that students will have the opportunity to observe surveillance methods for bat viruses.